manz’ abantu assisted the Chris Hani District Municipality in submitting an application through the Municipal Infrastructure Grant programme which was approved for the value of R25.3 million. The Chris Hani District Municipality appointed Amanz’ abantu as the as the Institutional and Social Development [ISD] Service Provider on the CHDM sanitation backlogs programme [Cluster 3] covering over 82 Villages at an estimated value of R2.8 milion. The project is to supply 4,622 households in 34 villages in Wards 4, 7, 8 and 23 in the Intsika Yethu Local Municipality in the Chris Hani District Municipality with Ventilated Improved Pit Toilets. Amanz’ abantu teamed with 2 other consultants appointed in adjacent wards and agreed to develop 24 local contractors under the Expanded Public Works Programme to implement the project. A tender was advertised for the supply of the top-structure materials to be delivered to a central store in Cofimvaba. The contractors would then collect the materials from the central store deliver it to, and erect it, over the pits where they have excavated and constructed collars or pit linings. The CHDM appointed Amanz’ abantu to provide training to the 24 contractors, plus their 24 supervisors, in accordance with the “National Qualification Framework” Level 4. Amanz’ abantu appointed South African Value Education (SAVE) for the classroom training. (SAVE are a subsidiary of Aurecon Consulting who are an Amanz’ abantu shareholder). 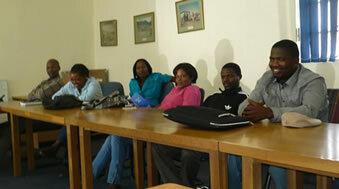 Training of the contractors and the supervisors commenced on 1 November 2010. Part of the training was for the contractors to “tender” for the work on the project after they had a “tender” meeting on site. Tenders were received from the contractors and the rates were adjudicated, adjusted and agreed. It is expected that after the training and the implementation of the project the contractors, who were mainly accredited with a CIDB Rating of 1CE PE, will be able to apply for a higher level of the CIDB grading.